Background: Nonalcoholic fatty liver disease (NAFLD) includes a group of chronic liver disorders caused by irregular accumulation of fat in liver tissue. The current study aimed to evaluate chemical composition and the effect of fruit extract and essential oil of Pimpinella anisum in experimental model of NAFLD. Materials and Methods: Sixty rats were randomly divided into ten groups, six in each group. NAFLD was induced in rats using choline-deficient diet for 90 days, followed by 30 days of treatment with 25, 50, 100, and 200 mg/kg/day of hydroethanolic extract (AE) as well as 0.125, 0.25, and 0.5 mg/kg/day of essential oil (AO). Blood samples were collected in the final day, and lipid profile, aspartate aminotransferase (AST), alanine aminotransferase (ALT) as well as biomarkers of oxidative damage including myeloperoxidase, lipid peroxidation, total thiol molecules, and ferric-reducing ability of plasma were measured. Liver tissue sections of the sacrificed rats were also assessed histologically. Results: AE and AO significantly reversed increase in the plasma levels of total cholesterol, low-density lipoprotein, and triacylglycerol and decrease in high-density lipoprotein level in a dose-dependent manner (P < 0.05). Serum levels of AST and ALT were also significantly modified by treatment with AE and AO (P < 0.05). Biomarkers of oxidative stress were modulated by administration of AE and AO (P < 0.05). Histological assessments also confirmed the effectiveness of treatments by reduced macrovesicular steatohepatitis. Conclusion: It could be concluded that P. anisum fruit extract and essential oil have beneficial effects in the treatment of NAFLD. Further studies are necessary to confirm safety and efficacy of this medicinal plant in clinical setting. Nonalcoholic fatty liver disease (NAFLD) is defined as a spectrum of chronic liver disorders caused by irregular accumulation of fat in liver tissue which results in steatosis, inflammation, and in severe cases, cirrhosis. NAFLD is categorized into two main types including simple steatosis (fatty liver) and nonalcoholic steatohepatitis. The former is usually considered as a benign condition, whereas the latter has severe complications such as inflammation, hepatocellular injury, fibrosis, cirrhosis, and hepatocellular carcinoma. The current treatment approaches for the management of NAFLD include lifestyle modification, antioxidant therapy, oral antidiabetics, lipid-lowering agents, surgical interventions, and in the end stage of hepatic injury, liver transplantation; however, not all of the mentioned choices provide acceptable result and are not always well tolerated by patients in long-term use. Different extracts and essential oil of anise showed antibacterial and antifungal activity against pathogens such as Staphylococcus aureus, Streptococcus pyogenes, Escherichia coli, and several species of the fungus, Candida. A double-blind, randomized clinical trial demonstrated beneficial effects of anise fruit in the treatment of dyspepsia. It decreased gastrointestinal complications and improved quality of life in patients with functional dyspepsia., In a study by Jamshidzadeh et al., different extracts and essential oil of anise fruit showed hepatoprotective activity in human hepatoma cell line. The preparations also decreased cellular and oxidative damage caused by CCl4 in liver tissue of Sprague-Dawley rats. Anise fruit also showed antidiabetic and lipid-lowering activity in a clinical trial in type 2 diabetic patients which was, at list in part, explained by its antioxidant activity. Taking into account the above-mentioned information regarding the biological activities of anise fruits in ancient and modern medicine, the current study has been performed to assess possible effect of P. anisum fruit extract as well as essential oil in animal model of NAFLD. For this purpose, biochemical parameters related to NAFLD along with histopathological investigation of liver tissue have been considered as primary outcomes. As oxidative stress has a major role in pathophysiology of NAFLD, the biomarkers associated with oxidative stress have been also determined as secondary outcomes. Formalin, hematoxylin, eosin, ethanol, paraffin, chloroform and diethyl ether were bought from Merck Co., (Germany). Kits for the measurement of triacylglycerol (TAG), total cholesterol (TC), high-density lipoprotein cholesterol (HDL-C), low-density lipoprotein cholesterol (LDL-C), alanine aminotransferase (ALT), and aspartate aminotransferase (AST) were obtained from Sigma-Aldrich (Steinheim, Germany). Standard choline-deficient diet (CDD) was supplied from Harlan Teklad (Milano, Italy). The plant was purchased from market and was authenticated by botanist as P. anisum L. (voucher number: PMP-667). Extraction of the fruits was performed using boiling water, and the collected extract was concentrated by rotary evaporator at 45°C temperature. Essential oil of the fruits was obtained by steam distillation method using Clevenger apparatus. Essential oil was analyzed using an Agilent 6890 gas chromatography (GC) system equipped with a BPX5 column (30 mm × 0.25 mm, film thickness 0.25 µm). The column temperature was programmed from 50°C, being held for 5 min, at a rate of 3°C/min to 240°C, at a rate of 15°C/min to 300°C, and being held for 3 min. The injector temperature was set at 290°C. Helium was used as a carrier gas with a flow rate of 0.8 mL/min. Mass spectroscopy (MS) was Agilent 5973 model mass detector with electron ionization system with ionization energy of 70 eV, and ionization source temperature of 220°C was used. For GC and GC-MS analysis, 1 µL of the essential oil dissolved in hexane was injected by the split mode (1:25). Electronic integration of the Flame Ionization Detector peak areas was used for determination of quantitative data. MSD Chemstation software (Agilent Technologies) was used for data analysis. Components were identified using their retention times to n-alkanes compared to those of Wiley 275 library and those described by Adams (2004). Male Wistar rats, aged 8–9 weeks and weighted 250–300 g, were used for this study. The animals were individually kept under standard vivarium condition (temperature of 25 ± 1°C and relative humidity of 45%–55%, 12 h light, and 12 h dark cycle) with free access to food and water for 1 week to become adapted to the animal laboratory condition. The experiment was approved by the animal ethics guidelines of Tehran University of Medical Sciences. NAFLD was induced with a CDD composed of lard (TD 98262) containing 6.5% kcal from protein, 46.7% kcal from carbohydrate, and 46.8% kcal from fat. Rats were randomly divided into ten groups with six animals in each group. The experiment was performed in two phases. In the first phase (90 days), all experimental groups received CDD for the induction of NAFLD, except one group which received normal pellet diet (sham). At the end of this phase, blood samples, collected from the jugular vein, were analyzed for the confirmation of NAFLD induction. In the second phase, lasted 30 days, sham group continued treatment with normal diet while CDD-treated animals received the following treatments: CDD along with vehicle (as negative control), simvastatin (10 mg/kg, as positive control), 25 mg/kg anise fruit extract (AE), 50 mg/kg AE, 100 mg/kg AE, 200 mg/kg AE, 0.125 ml/kg anise fruit essential oil (AO), 0.25 ml/kg AO, and 0.5 ml/kg AO. The suggested doses for AO were calculated based on a primary study for the determination of LD50. Animal weight gain was periodically measured. At the end of the second phase, all rats were sacrificed, blood samples were collected in heparinized test tubes, and the sera were obtained after centrifuge (3000 rpm) for 20 min. Serum levels of TC, LDL-C, HDL-C, TAG, AST, and ALT were measured using standard laboratory kits. Livers of sacrificed animals were also collected and fixed in buffered formalin (10%). Segments of 5 µm thickness were embedded in paraffin and were stained with hematoxylin and eosin (H and E) for the investigation of histological changes under ×100 magnification (optical microscope, ZEISS GERMANY). Defrosted plasma was mixed with 50 mM phosphate buffer containing 0.167 mg/ml o-dianisidine hydrochloride and 0.0005% H2O2. Absorbance of the mixture was measured at 460 nm for 3 min using an ultraviolet-visible spectrophotometer (GBC, Cintra 40). One unit of myeloperoxidase (MPO) activity was equal to the change in absorbance per min at room temperature in the final reaction. Evaluation of lipid peroxidation (LPO) was performed using thiobarbituric acid reactive substances. Trichloroacetic acid (20%) was mixed with defrosted plasma, and the residual was reacted with 0.05 M sulfuric acid (H2 SO4). 2-thiobarbituric acid was then mixed with the solution, and the mixture was incubated for 30 min in boiling water bath. Extraction of the final solution was performed with n-butanol, and the absorbance was measured at 532 nm (ELISA reader, Biotek, Germany). Plasma total thiol molecule (TTM) was measured using the reaction of 5'5'-dithiobis-nitrobenzoic acid with the samples which resulted in a yellow complex. The absorbance was then read at 412 nm. Fresh ferric-reducing ability of plasma (FRAP) reagent (25 mL of 0.3 M acetate buffer, 2.5 mL of TPTZ solution, and 2.5 mL of FeCl3.6H2O solution) was reacted with defrosted plasma, and the absorbance of the obtained blue complex was measured at 593 nm. All treatment groups were compared using one-way analysis of variances followed by Tukey's post hoc test in SPSS 15 software (SPSS Inc., Chicago, IL). Statistical significance was defined as P < 0.05. The yield of aqueous extract and essential oil extraction was 24.36% and 1.5%, respectively. The essential oil was mainly composed of oxygenated monoterpene hydrocarbons (95.81%) with trans-anethole as the principle component (89.24%). 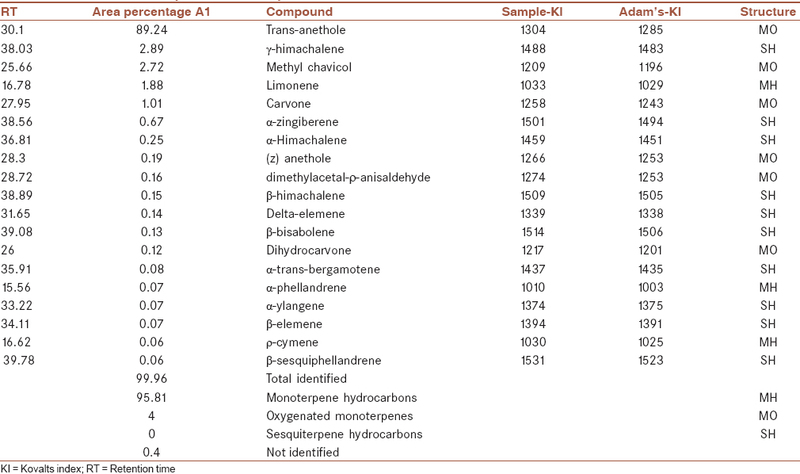 γ-himachalene (2.89%) with sesquiterpene structure, methyl chavicol (2.72%), and limonene (1.88%) are other main components of the essential oil [Table 1]. Animals received CDD showed significantly higher weight gain in comparison to normal diet group (P = 0.001). 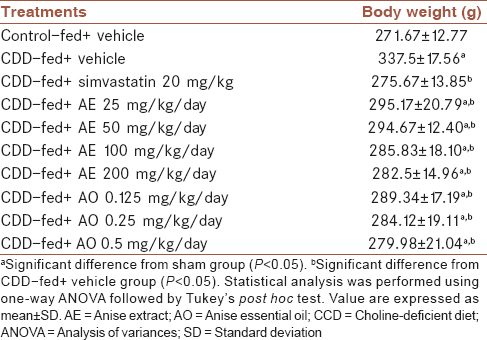 As it is shown in [Table 2], anise fruit extract and essential oil with all evaluated doses were able to significantly decrease weight gain compared with vehicle-treated group (P < 0.05). Lipid profile was significantly altered in animals fed with CDD [Table 3]. TC, LDL-C, and TAG were increased and HDL-C was decreased due to NAFLD induced by CDD (P = 0.001). Treatment with AE and AO could reverse the alterations in lipid profile of rats in a dose-dependent manner. All doses of tested materials were significantly effective toward the reduction of TC, LDL-C, and TAG (P < 0.05). Highest doses of AE (200 mg/kg/day) and AO (0.5 ml/kg/day) showed the best lipid-lowering activity [Table 3], P = 0.001]. The same effect was observed regarding HDL-C level. All doses of the extract and essential oil could significantly improve serum HDL-C level compared with vehicle-treated group (P < 0.05). It is worthy to mention that 200 mg/kg/day of the extract could modify lipid profile parameters (except for TC) to the level of normal diet-treated group [Table 3]. The levels of hepatic enzymes AST and ALT were significantly elevated as a result of CDD-induced NAFLD [Figure 1]. AE and AO with all doses were able to significantly reverse this increase (P < 0.05). The dose of 200 mg/kg/day AE as well as simvastatin showed the best effect by decreasing the levels of these enzymes to the same level of normal diet group [Figure 1], P = 0.001]. Histological evaluations were performed using H and E staining method [Figure 2]. Normal diet rats showed normal liver histology. In vehicle-treated group, severe vacuolar degeneration and hepatocyte swelling were observed which confirmed the induction of NAFLD. Treatment with 200 mg/kg/day of AE and 0.5 ml/kg/day of AO as well as simvastatin could remarkably decrease macrovesicular steatohepatitis in tissue sections of animals. Other doses of AE and AO showed the positive effect to a lesser extent. Both AE and AO were effective to modulate biomarkers of oxidative damage including FRAP, LPO, TTM, and MPO. In FRAP, LPO, and TTM test, all doses of fruit extract and essential oil were able to produce a significant difference in comparison to vehicle-treated group [Figure 1], P = 0.001]. In MPO test, all doses of AE as well as 0.5 ml/kg dose of AO reduced MPO level; however, lower doses of AO were not able to make any significant change [Figure 1], P = 0.998 for 0.125 mg/kg and P = 0.101 for 0.25 mg/kg]. NAFLD is one of the most common liver disorders with an increasing prevalence in developed countries due to unhealthy high-fat and high-carbohydrate diets. Treatment approaches for the management of NAFLD are lifestyle modification, antioxidants, oral hypoglycemic agents, antihyperlipidemics, and surgical interventions in severe cases, which enforce high costs to patients as well as health-care system. Thus, scientists are seeking new ways with higher efficacy and lower cost as well as better patient's compliance to treat NAFLD. P. anisum has a long history of medicinal use in traditional and folkloric medicine of Iran. The present study demonstrated the effectiveness of AE and AO in animal model of NAFLD induced by CDD. CDD causes less production of very LDL-C which results in TAG accumulation in liver tissue and provides a suitable model for the assessment of drugs in NAFLD. In our study, both AE and AO showed positive effects toward the reduction of weight gain compared with vehicle-treated group. The effect was in a dose-dependent manner so that 200 mg/kg/day of AE and 0.5 ml/kg/day of AO were the most effective treatments. All treatment groups represented reduced serum levels of TC, LDL-C, and TAG and increased HDL-C level. As one of the treatment approaches for NAFLD are antihyperlipidemic agents, it could be concluded that AE and AO can protect fat accumulation in liver tissue through modulation of lipid profile. Administration of anise fruit to patients with type 2 diabetes mellitus decreased fasting blood glucose, serum cholesterol, and TAG. Protein oxidation in serum and LPO in erythrocytes and plasma was also decreased. A significant rise in serum β-carotene, Vitamin A, and Vitamin C levels was also reported., β-carotene was associated with histological amelioration as well as decrease in hepatic enzymes and improvement of lipid profile in rats with NAFLD. Cao et al. demonstrated lower risk for developing NAFLD among Chinese adults with higher serum carotenoids. Retinoic acid, an active metabolite of Vitamin D, was showed to be lower in subjects with NAFLD compared to healthy controls. A growing body of evidence suggests that oxidative stress has a key role in several chronic conditions, including metabolic disorders. Considering antioxidant therapy as one of the current treatments for NAFLD, it could be concluded that free radicals are involved in the pathogenesis of fatty liver disease. In the present study, measurement of serum levels of oxidative damage biomarkers including FRAP, LPO, TTM, and MPO demonstrated that anise fruit extract as well as essential oil could improve antioxidant defense mechanisms. As a result, anise fruit is not only useful due to its ability to modify lipid profile but also represents observable in vivo antioxidant activity, thus has a dual action against the disease progression. Histopathological investigations also confirmed less vacuolar degeneration and macrovesicular steatohepatitis in the tissue sections of animals treated with high doses of AE and AO. Hepatic enzymes including AST and ALT were increased in animals fed with CDD. Treatment with AE and AO as well as gold standard drug, simvastatin, significantly reversed this increase in comparison to vehicle-treated group. Jamshidzadeh et al. demonstrated that different extracts and essential oil of anise fruits have hepatoprotective activity both in vitro and in vivo. Anise fruit decreased CCl4-induced hepatotoxicity in Sprague-Dawley rats as well as hepatoma cell line. The main chemical compounds of essential oil were trans-anethole (89.24%), γ-himachalene (2.89%), and methyl chavicol (2.72%). Samojlik et al. showed the major constituents of anise essential oil were trans-anethole (87.96%) followed by γ-himachalene (3.17%), cis-isoeugenol (2.21%), and linalool (1.78%). In another study on chemical composition of essential oil, anethole accounted for 88.1% of identified constituents, followed by pseudo-iso-eugenyl-2-methyl butyrate (4.15%), and γ-himachalene (4.15%). Trans-anethole showed hepatoprotective activities in hepatic ischemia/reperfusion injury in mice with reduction of serum ALT, tumor necrosis factor-α, and interleukin 6 levels. Increased in nuclear translocation of interferon regulatory factor-1 (IRF-1), release of high-mobility group box-1 into the extracellular milieu, and the interactions between IRF-1 and histone acetyltransferase p300 after ischemia/reperfusion were attenuated by trans-anethole. Moreover, trans-anethole suppressed increases in toll-like receptor-4. Using the animal model of CDD-induced fatty liver disease, the present study confirmed the traditional use of P. anisum extract and essential oil in NAFLD. This effect was demonstrated by the measurement of weight gain, lipid profile parameters, hepatic enzymes, and histopathological assessments of liver tissue. Further mechanistic studies as well as clinical trials are mandatory to prove the efficacy of the plant extract and essential oil as a treatment for NAFLD in human subjects. This study has been partially supported by Tehran University of Medical Sciences; Grant No. 93-04-159-28029. AA contributed in conducting the study, analyzing data, and drafting manuscript. MM contributed in revising the draft, approval of the final version of the manuscript, and agreed for all aspects of the work. RR contributed in the conception of the work, revising the draft, approval of the final version of the manuscript, and agreed for all aspects of the work. Malhotra N, Beaton MD. Management of non-alcoholic fatty liver disease in 2015. World J Hepatol 2015;7:2962-7. Masarone M, Federico A, Abenavoli L, Loguercio C, Persico M. Non alcoholic fatty liver: Epidemiology and natural history. Rev Recent Clin Trials 2014;9:126-33. Oliveira CP, de Lima Sanches P, de Abreu-Silva EO, Marcadenti A. Nutrition and physical activity in nonalcoholic fatty liver disease. J Diabetes Res 2016;2016:4597246. Eminler AT, Aygun C, Konduk T, Kocaman O, Senturk O, Celebi A, et al. The relationship between resistin and ghrelin levels with fibrosis in nonalcoholic fatty liver disease. J Res Med Sci 2014;19:1058-61. Farzaei MH, Rahimi R, Farzaei F, Abdollahi M. Traditional medicinal herbs for the management of diabetes and its complications: An evidence-based review. Int J Pharmacol 2015;11:874-87. Hasani-Ranjbar S, Jouyandeh Z, Abdollahi M. A systematic review of anti-obesity medicinal plants – An update. J Diabetes Metab Disord 2013;12:28. Farzaei MH, Shams-Ardekani MR, Abbasabadi Z, Rahimi R. Scientific evaluation of edible fruits and spices used for the treatment of peptic ulcer in traditional Iranian medicine. ISRN Gastroenterol 2013;2013:136932. Aghili MH. Makhzan Al-Adviah. Tehran, Iran: Research Institute for Islamic and Complementary Medicine; 2008. p. 239. Pourgholami MH, Majzoob S, Javadi M, Kamalinejad M, Fanaee GH, Sayyah M. The fruit essential oil of Pimpinella anisum exerts anticonvulsant effects in mice. J Ethnopharmacol 1999;66:211-5. Karimzadeh F, Hosseini M, Mangeng D, Alavi H, Hassanzadeh GR, Bayat M, et al. Anticonvulsant and neuroprotective effects of Pimpinella anisum in rat brain. BMC Complement Altern Med 2012;12:76. Ozcan MM, Chalchat JC. Chemical composition and antifungal effect of anise (Pimpinella anisum L.) fruit oil at ripening stage. Ann Microbiol 2006;56:353-8. Shojaii A, Abdollahi Fard M. Review of Pharmacological Properties and Chemical Constituents of Pimpinella anisum. ISRN Pharm 2012;2012:510795. Kunzemann J, Herrmann K. Isolation and identification of flavon (ol)-O-glycosides in caraway (Carum carvi L.), fennel (Foeniculum vulgare Mill. ), anise (Pimpinella anisum L.), and coriander (Coriandrum sativum L.), and of flavon-C-glycosides in anise. I. Phenolics of spices (author's transl). Z Lebensm Unters Forsch 1977;164:194-200. Lee JB, Yamagishi C, Hayashi K, Hayashi T. Antiviral and immunostimulating effects of lignin-carbohydrate-protein complexes from Pimpinella anisum. Biosci Biotechnol Biochem 2011;75:459-65. Ghoshegir SA, Mazaheri M, Ghannadi A, Feizi A, Babaeian M, Tanhaee M, et al. Pimpinella anisum in modifying the quality of life in patients with functional dyspepsia: A double-blind randomized clinical trial. J Res Med Sci 2014;19:1118-23. Ghoshegir SA, Mazaheri M, Ghannadi A, Feizi A, Babaeian M, Tanhaee M, et al. Pimpinella anisum in the treatment of functional dyspepsia: A double-blind, randomized clinical trial. J Res Med Sci 2015;20:13-21. Jamshidzadeh A, Heidari R, Razmjou M, Karimi F, Moein MR, Farshad O, et al. An in vivo and in vitro investigation on hepatoprotective effects of Pimpinella anisum seed essential oil and extracts against carbon tetrachloride-induced toxicity. Iran J Basic Med Sci 2015;18:205-11. Rajeshwari CU, Shobha RI, Andallu B. Oxidative stress and antioxidant effects of herbs and spices in diabetes. Ann Phytomed 2013;2:13-27. Farzaei MH, Rahimi R, Attar F, Siavoshi F, Saniee P, Hajimahmoodi M, et al. Chemical composition, antioxidant and antimicrobial activity of essential oil and extracts of Tragopogon graminifolius, a medicinal herb from Iran. Nat Prod Commun 2014;9:121-4. Gabbi C, Bertolotti M, Anzivino C, Macchioni D, Del Puppo M, Ricchi M, et al. Effects of bile duct ligation and cholic acid treatment on fatty liver in two rat models of non-alcoholic fatty liver disease. Dig Liver Dis 2012;44:1018-26. Khanavi M, Sabbagh-Bani-Azad M, Abdolghaffari AH, Vazirian M, Isazadeh I, Rezvanfar MA, et al. On the benefit of galls of Quercus brantii Lindl. in murine colitis: The role of free gallic acid. Arch Med Sci 2014;10:1225-34. Rahimi R, Baghaei A, Baeeri M, Amin G, Shams-Ardekani MR, Khanavi M, et al. Promising effect of Magliasa, a traditional Iranian formula, on experimental colitis on the basis of biochemical and cellular findings. World J Gastroenterol 2013;19:1901-11. Soleimani H, Ranjbar A, Baeeri M, Mohammadirad A, Khorasani R, Yasa N, et al. Rat plasma oxidation status after Nigella sativa L. botanical treatment in CCL (4)-treated rats. Toxicol Mech Methods 2008;18:725-31. Rajeshwari CU, Abirami M, Andallu B.In vitro and in vivo antioxidant potential of aniseeds (Pimpinella anisum). Asian J Exp Biol Sci 2011;2:80-9. Rajeshwari U, Shobha I, Andallu B. Comparison of aniseeds and coriander seeds for antidiabetic, hypolipidemic and antioxidant activities. Spatula DD 2011;1:9-16. Seif El-Din SH, El-Lakkany NM, El-Naggar AA, Hammam OA, Abd El-Latif HA, Ain-Shoka AA, et al. Effects of rosuvastatin and/or ß-carotene on non-alcoholic fatty liver in rats. Res Pharm Sci 2015;10:275-87. Cao Y, Wang C, Liu J, Liu ZM, Ling WH, Chen YM. Greater serum carotenoid levels associated with lower prevalence of nonalcoholic fatty liver disease in Chinese adults. Sci Rep 2015;5:12951. Liu Y, Chen H, Wang J, Zhou W, Sun R, Xia M. Association of serum retinoic acid with hepatic steatosis and liver injury in nonalcoholic fatty liver disease. Am J Clin Nutr 2015;102:130-7. Rani V, Deep G, Singh RK, Palle K, Yadav UC. Oxidative stress and metabolic disorders: Pathogenesis and therapeutic strategies. Life Sci 2016;148:183-93. Samojlik I, Petkovic S, Stilinovic N, Vukmirovic S, Mijatovic V, Božin B. Pharmacokinetic herb-drug interaction between essential oil of aniseed (Pimpinella anisum L. Apiaceae) and acetaminophen and caffeine: A Potential Risk for Clinical Practice. Phytother Res 2016;30:253-9. Fitsiou E, Mitropoulou G, Spyridopoulou K, Tiptiri-Kourpeti A, Vamvakias M, Bardouki H, et al. Phytochemical Profile and evaluation of the biological activities of essential oils derived from the Greek aromatic plant Species Ocimum basilicum, Mentha spicata, Pimpinella anisum and Fortunella margarita. Molecules 2017;22. pii: E1069. Cho HI, Kim KM, Kwak JH, Lee SK, Lee SM. Protective mechanism of anethole on hepatic ischemia/reperfusion injury in mice. J Nat Prod 2013;76:1717-23.